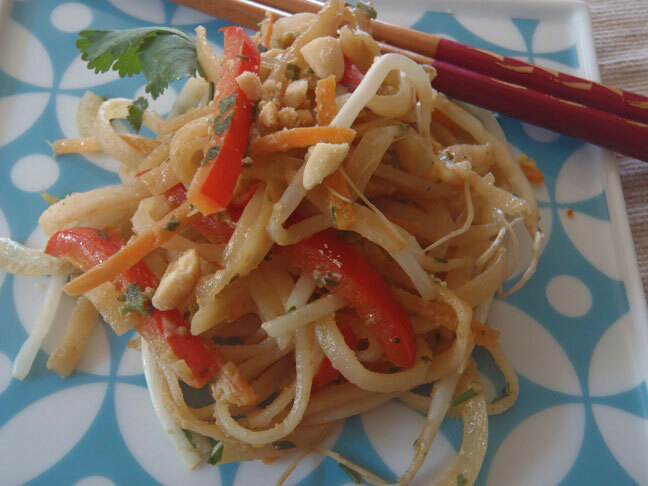 Here's a super yummy recipe for Thai food lovers! Although there's no meat, this recipe offers a ton of protein with eggs, peanut butter, and peanuts. 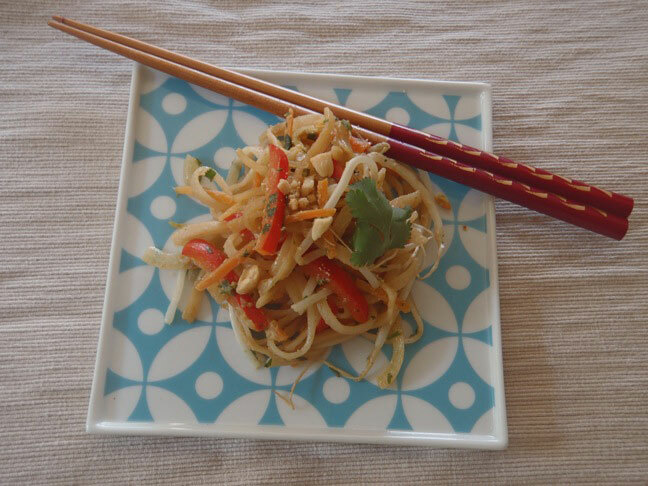 And because it's made with rice noodles, Pad Thai also makes for a fantastic gluten-free dish! This is one my boys like "parts of." In other words, they don't eat all the vegetables, but they love the noodles and sauce! Cook the noodles in a large pot of boiling, salted water just until tender but still firm to bite, about 4 minutes. Remove half a cup of the water and set it aside. Then drain the noodles and toss them with a bit of oil and set aside. To make the sauce: in a medium-sized mixing bowl, whisk the lime juice with the fish sauce, soy sauce, peanut butter and sugar. Set aside. Coat a large saute pan with vegetable or grape seed oil. Place the pan over medium heat, add the onion and cook until soft, about 3 minutes. Add the pepper and carrots and continue to cook, stirring occasionally, until the carrots are tender, about 5 minutes. Add the bean sprouts, stir to combine, and move everything to one side of the pan. Add a bit more oil to the clear side of the pan and add the eggs. Gently scramble the eggs and then incorporate them into the vegetables. Pour the sauce into the pan, along with the cilantro, and cook to combine all of the flavors, about 3 minutes. Add the noodles to the pan along with the reserved 1/2 cup of cooking water and stir the noodles so they're covered with the vegetables and sauce. If you're a gluten-free eater — make sure to use Tamari or Liquid Aminos in lieu of regular soy sauce. Pad Thai rice noodles can be found in the Asian aisle in most major supermarkets. Grape seed oil is a wonderful choice. It's very low in saturated fat, has a high burning point, and doesn't interfere with the other flavors. It's my first choice when I cook with Asian flavors.